Depending on where you go and what you eat, dining can be expensive. What is considered expensive? It all depends on what you think, but I think most of you will agree that too many restaurants today are overcharging for food. I question a restaurant’s logic of overcharging customers for food. Sure, a chef or owner could argue that certain items costs more to purchase and serve. They could also argue that they have the right to charge whatever price they like because the restaurant is fine dining. Furthermore, they could argue that certain foods require special preparation before serving and therefore, we must charge higher. Let’s take out a look at some of the most expensive foods in restaurants today and judge for yourself, would you pay that much? In 2006, the L.A. Times wrote a story about the Old Homestead Steak in Boca Raton which features a $100 burger. Are they crazy? A burger is something I grew up loving as a kid and as long as I can remember, my parents would treat me to a $1 burger meal at McDonald’s. Sure, this isn’t any fast food joint, but what kind of burger is worth $100? According to the L.A. Times, the burger features a 20oz. blend of American prime, Japanese Wagyu/Kobe and Argentinian beef. Wow! That is 1 ¼ lbs. of premium beef. You thought a $100 burger was crazy, think again. Can it really be true that the most expensive burger meal in the world is $5000? Yes, The Mandalay Bay Hotel and Resort in Las Vegas uses foie gras, black Perigord truffles, truffle sauce on a truffle brioche bun. What’s the catch? It comes with a 1990 Chateau Petrus, a French Bordeaux that sells normally for over $2000. The wine comes along with imported glasses from Italy that cost over $100 for a set of 2. How about minus all the extras and just give me the burger! If you haven’t heard of Kobe beef, it’s a popular well marbled beef from Japan that has a “melt in your mouth” texture of foie gras. According to legend, the cattle is fed with beer and massaged by human hands. So if it’s compared to foie gras, you probably guessed it already that this isn’t any cheap cut of meat. An 8oz. 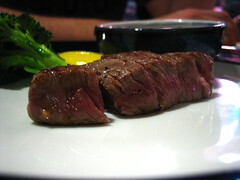 Kobe beef steak at the Bradley Ogden Restaurant in Las Vegas will cost you $264 and that’s just for the steak alone. For the same size of cut, customers pay $301 at Tokyo’s Aragawa restaurant. So much hype about Kobe beef has people flocking to high end restaurants just to taste the famed beef. In L.A., Wolfgang Puck’s new steakhouse, CUT, serves an 8oz. Kobe rib eye flown in from Japan for $160. If you want high quality sushi, it is going to cost you. Some of the best Japanese restaurants fly their fish in directly from Japan and therefore their daily menu reflects the availability of fresh fish. Here is a quick side note on nigiri sushi: raw fish on a ball of rice. On average in a city like Toronto, nigiri sushi will cost you $2.25 per piece and depending on the type of fish the cost can be twice as much. In Boston’s Oya restaurant, nigiri sushi cost $19 to $22 per piece. That’s insanely high! But if you have heard of Masa at the Time Warner Center in New York City, you will know that $22 for one nigiri may be affordable compared to this place. At Masa, customers are charged automatically $400 per person for a 30-course Omakase menu which is a Japanese tasting menu chosen by the chef. There is no other menu and if you can’t finish your meal, too bad. The restaurant has already charged you $400 and this doesn’t include tax, tip or alcohol. You better bring a deep pocket full of money to pay for this meal. When I hear of restaurants charging outrageous prices for food, it astonishes me. Chefs become great chefs because they have deep passion for food and they love sharing food to an audience. If this is the case, why are some chefs charging more for a meal compared to what it should be? Should a chef be cooking for one individual willing to pay $100 or $1000 for a meal, or should a chef be cooking to share his food with a larger audience? I think too many restaurants have fell in this high price trap. As it seems, the whole ultra expensive restaurant creates media attention and promotes a sense of exclusivity. I have paid my share of expensive meals, but I do have control of how much I will pay. Dining like this is only fit for a king. This entry was written by TheRestaurantBlogger and posted on April 30, 2008 at 7:00 am and filed under Restaurant Ramblings. Bookmark the permalink. Follow any comments here with the RSS feed for this post.